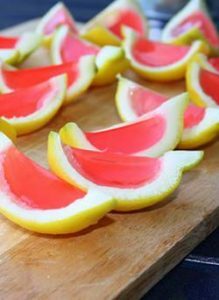 10 Cocktail Inspired Jello Shots You Have To Try! A party just wouldn’t be as fun without some fabulous drinks! One thing I enjoy about any Bachelorette party, Girls Night Out, Birthday party, or other get together is having a great cocktail with friends! So how fun to take some favorite cocktails and make 10 cocktail inspired Jello shots!! 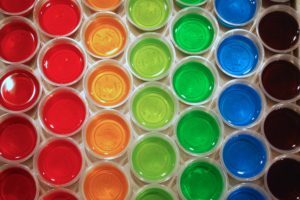 Even if your party is non-alcoholic, you can still provide some bachelorette fun with these Jello shots….simply use a substitute (like water) for the alcohol. All the fun and games without the potential hangover! I love Jello shots! First, they are very easy to make (in small or large batches!). Secondly, they are fun to display, especially if you make them in a variety of coordinating colors. In addition, you can make them ahead of time…..which means less to do on the day of the party. Most importantly you won’t get stuck playing bartender all night. Now that’s what I call a Win! and Gin & Tonic, which can all be found here. Ok, no more waiting. 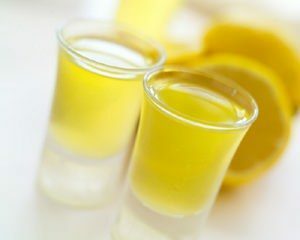 Finally, I give you the fabulous Amaretto Sour Jello Shot we found and love. 1 tbsp unflavored gelatin powder, 3/4 cup sweet & sour mix, 1/2 cup amaretto liqueur, 2 tbsp simple syrup, 9 maraschino cherries (stems removed), and our Jello Shot cups. 1. First, place the gelatin in a medium-size mixing bowl. Next, pour in 1/4 cup sweet & sour mix. Whisk to combine and set aside. 2. Then, in a small saucepan, heat the remaining sweet & sour until just simmering. 3. Next, pour the hot liquid over the gelatin mix and whisk to combine until the gelatin is dissolved. 4. Add the Amaretto and simple syrup to the jello mixture and whisk to combine. 5. Finally, pour the jello mixture into each plastic Jello shot cup, about 3/4 full. Place them in a refrigerator for 30-60 minutes. After they chill and are no longer liquids, then push a cherry into each one and return to the fridge for 1-2 hours, or overnight. Lastly, enjoy these delicious Jello shots (responsibly) with your friends! In closing, thanks again to lipglossandcrayons.com for this recipe. For more details on the Amaretto Sour Jello Shot, or others, visit us on Pinterest. This entry was posted in Bachelor, Bachelorette Cocktail Supplies, Bachelorette Party, Bachelorette Party Planning, Party Planning on March 24, 2017 by Tiffany Freitag.